Here’s another lamb recipe from my left over lamb feature in Good Taste Magazine and this week it’s a deliciously simple Shepherds Pie. 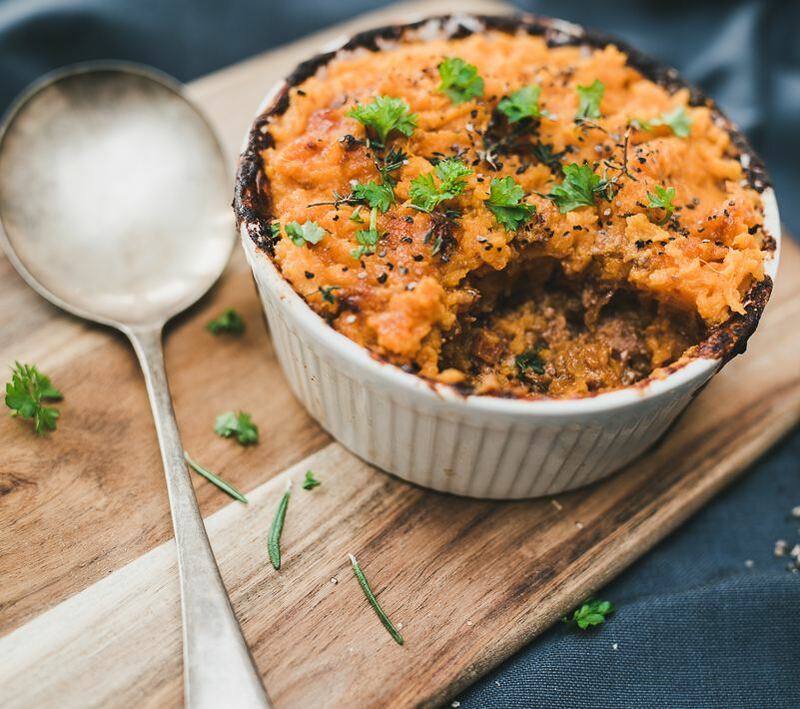 We’ve cut down on those starchy white potatoes and swapped them for a deliciously fluffy sweet potato topping, not only adding a little sweetness to this family favourite, but cutting down on the carbs, making it that little bit more guilt free. In a large pan filled with water, add the sweet potatoes and cook for 30 minutes before draining and placing back into the pan. Add butter and mash together over a low heat. Once all of the potatoes are smooth and mashed together, stir over a low heat for 15 minutes, to reduce down and rid of any excess water. Once cooked, season with salt and pepper and leave to one side until the lamb mixture is ready. In a large, heavy based frying pan, cook the shallot, carrot, swede, leek and celery in 1tbsp of olive oil for 2 mins on a medium heat. Add the Garlic, Rosemary & bay leaves, and cook for 5 minutes to enhance the flavour of all the vegetables, before adding the diced lamb and cooking on a low heat for a further 2 minutes. Remove the bay leaves and add the tomato purée, gravy and brown sauce to the meat and vegetable mixture and cook for 10 minutes, until all of the delicious ingredients have broken down and reduced. 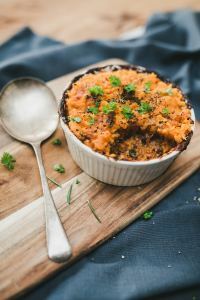 Place the lamb into 4 oven-proof bowels, or a large baking dish and top evenly with the sweet potato mash. As a naughty addition, add grated mozzarella and cheddar before placing into a 180ºc oven for around 20 minutes before serving.